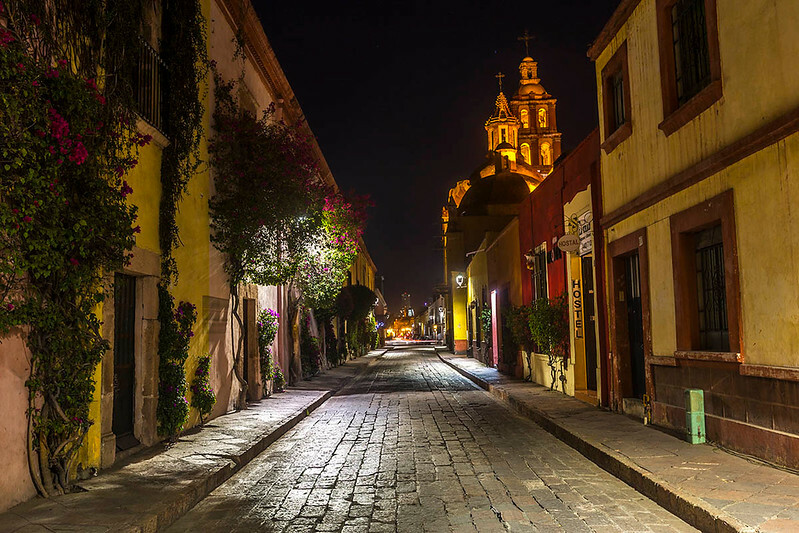 Are you looking for the best places to eat in Queretaro, Mexico? Isabella Biava of Boundless Roads, who left her full-time job to embark on a voyage of self-discovery throughout Mexico and around the world, shares her recommendations on where to find fantastic vegan eats in her favorite food town. 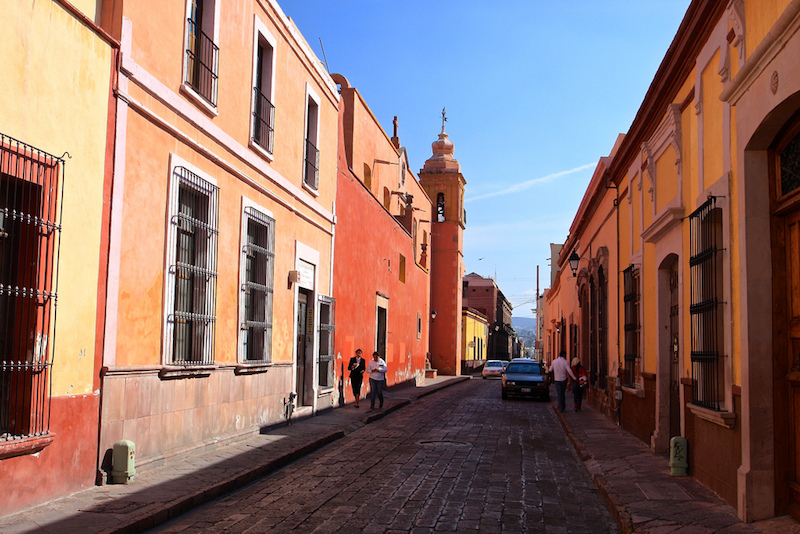 I am on an never-ending trip around Mexico, and I could not skip the city of Queretaro for the world. I have always heard wonders about this historical city, and I wanted to see it with my eyes. And so I went. 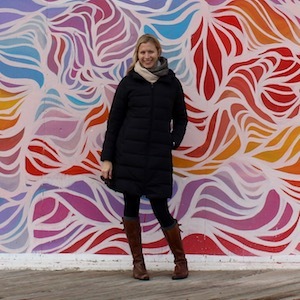 I spent a whole week exploring this quaint, beautiful city and living like a local, stopping in cafes to work and visiting museums or walking around its stunning historical buildings and well-kept plazas. The city itself is an open-air museum and since I was there for an entire week, I got to appreciate the huge variety of the restaurants available. Most of all I was really impressed to find a lot of vegan awareness, and there were so many regular restaurants with real vegan options – not just a salad. Here I have selected a few remarkable places. 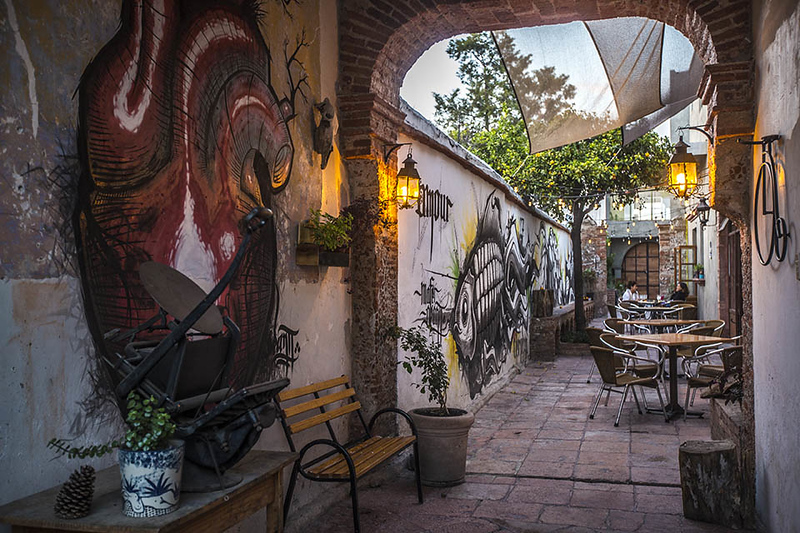 This lovely café/restaurant was suggested to me by a friend from Queretaro, and I couldn’t be more grateful for this tip. La Vieja Varsovia is small and cozy, and if it’s not cold, you can enjoy a lovely space outside on the plaza (otherwise, they have blankets to warm you up). Service is great, and the place has very good energy. The menu is based mostly on pizza and bread, and they also sell homemade bread loaves to go. (It’s a popular spot for coffee and bread, in fact.) If you are vegan, you can ask for the pizza without cheese or with vegan cheese, which they have! I was surprised…again. The pizza is very far from Italian pizza, but it is still delicious. The dough is very thin and in some parts crispy. I made an effort to finish it because it was a lot. They also have hot chocolate made with water and organic cocoa brought from Oaxaca, the mecca of chocolate, and delicious vegetable-only salads and sandwiches. Among other beverages are specially flavored lemonades made with different kinds of tea and a local soda called BUHO (OWL, my favorite bird, by the way), which is actually made of natural fruit juice and sweetened with pure agave syrup. Also, they offer a huge variety of teas and infusions, and they have rice and soy milk. I am not the only one who thinks this is a special place, as I have arrived right on time to find an empty table – five minutes later I would see crowds looking for a table in vain. Tesguino is where I found the best vegan burger ever. It was made with a huge portobello mushroom, a thick and big one, which was artfully sautéed, and had layers of green peas and tomatoes and some olive oil. It came with salad and mashed potatoes – the owner had the sensitivity to inform me that the potatoes had a little bit of butter in them, so he offered me a bigger salad instead. I really appreciate those little gestures as they show care and respect for people’ choices. The bread was homemade, crispy outside and soft inside; the salad was not only delicious with a delicate sesame dressing but also nicely presented. It was pure bliss eating it, almost mystical if you are a foodie like me. I found this place by chance – the entrance was advertising an art exhibition that attracted me. There I bumped into the owner who kindly welcomed me and offered to show me the menu. When I asked if they had vegan options, he was totally ready to answer with his special portobello dish as well as other plates mentioned on the rich menu. Even if it is not a vegan restaurant per se, you can be sure that they are vegan sensitive and very happy to serve us veggie-addicts. Maco Cafe was a pleasant surprise. I just found it on Google and didn’t know what to expect. It turned out to be a real gem; although not properly a vegan restaurant, its long menu that would make anybody happy. They have a fixed menu, which changes every week, and it includes vegan, vegetarian and omni-eater options. 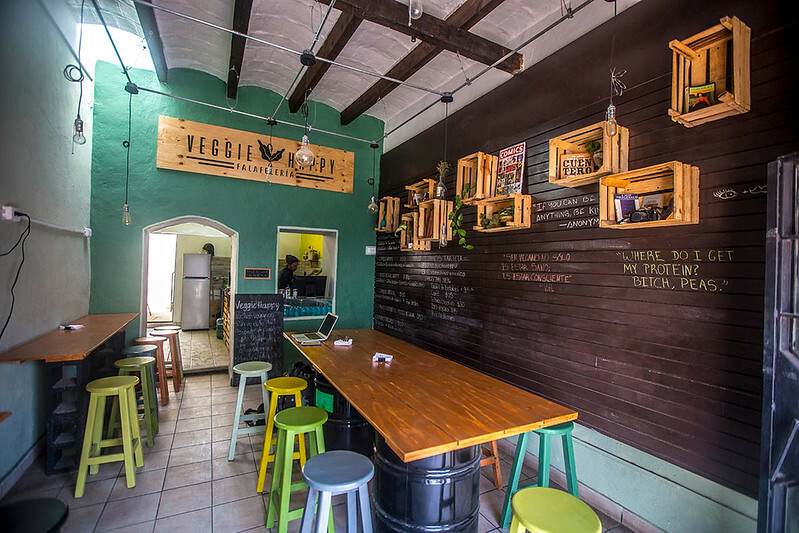 You can find vegan or vegetarian specialties like mushroom tacos and different kinds of pasta, soups, sandwiches, and salads, as well as fresh juices of all sorts. There is a very cozy, laid-back atmosphere, and I enjoyed working a little from there – they don’t bother you as they have lots of tables. This warm, welcoming place was the first I tried, and it met all my expectations, not only for the great vegan menu but also for the painted walls and smiling hosts. 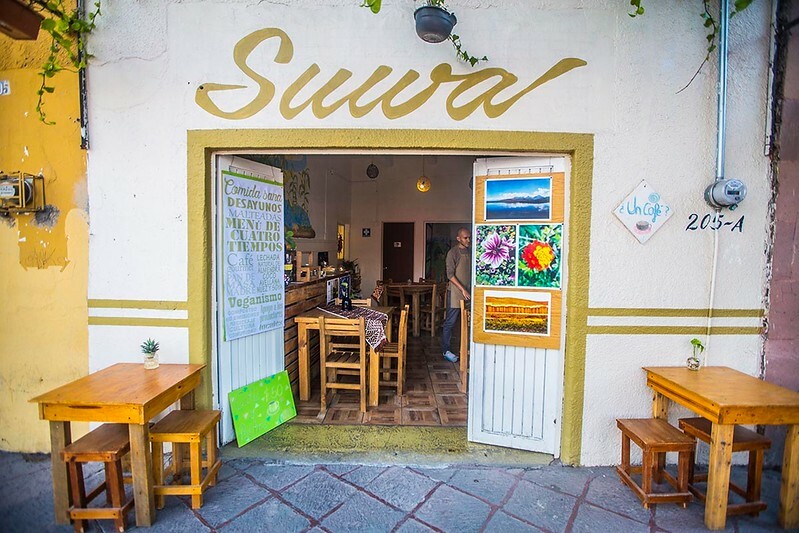 Suwa Vegan Restaurant offers a fixed menu for lunch that varies every day for 130 pesos. That’s not a lot in general, but it’s quite a bit for Mexico. However, it’s all worth it. The dishes are very elaborate and abundant, and for breakfast, they have many different delicious options to chose from (There’s no wi-fi available). La Biznaga is very popular among locals for its delicious breakfast and huge variety of options but most of all for the crazy interior design – graffiti and many different pieces of art. It has four separate rooms with different layouts and sitting options. When I looked at the long menu, I was disappointed not to find anything vegan; however, when the waiter came to take the order I asked him for vegan options. To my surprise he was totally on it, ready to answer with three dishes that could be made vegan by substituting the cheese with avocado and mushrooms (which I love). A 15 minute-walk from the historical center, this new little gem has just opened and offers vegan Middle Eastern dishes and delicious vegan deserts. Try the brownie, it’s to die for. Veggie Happy is really cozy, and the owners are very sweet and enthusiastic. 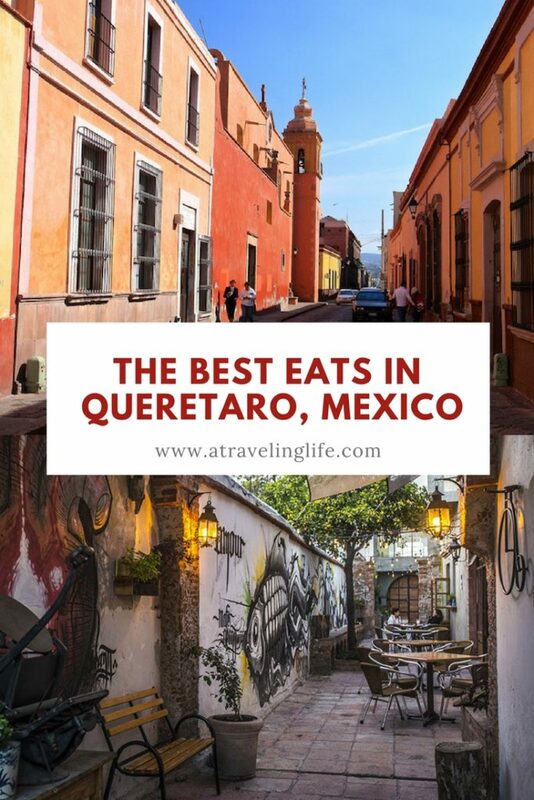 What do you think are the best places to eat in Queretaro? This is the third post in the “My Favorite Food Town” series. The first post features Northampton, Massachusetts, and the second features Durham, North Carolina.